This is a quick post, but it seems like everyone seems to go crazy for rhubarb. So I wanted to post something showing how to freeze some rhubarb so that you can have some on hand months after the season is done. It’s simple and the process takes just a couple of minutes. The only area of concern is making sure you have enough space in your freezer! 1. 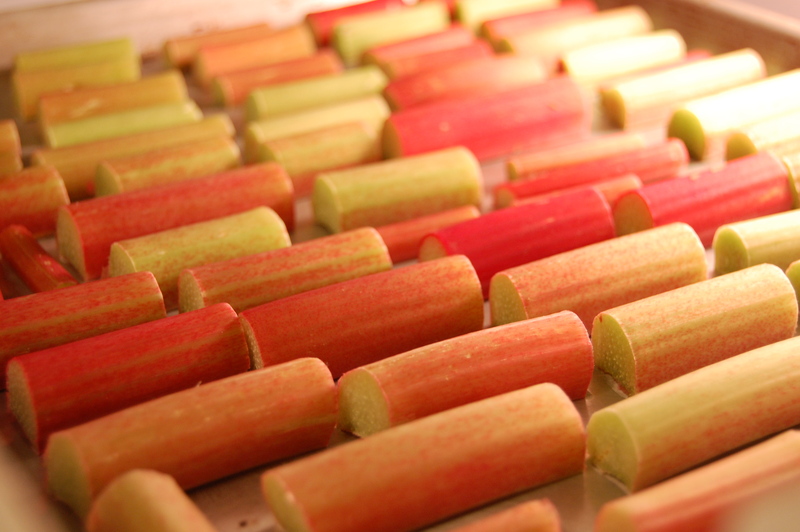 Wash your rhubarb and allow it to dry. While waiting for it to dry, use the permanent marker to label and date the freezer bags. 2. Chop them into 1″ or 2″ pieces. Lay them onto the sheet pan in a single layer, leaving some space in between the pieces. Put the pan into the freezer. 3. Leave in the freezer for a couple of hours, just to be sure that everything is frozen. Once frozen, transfer them into the labeled freezer bags and remove as much air as possible before sealing them. You could use a straw to remove the air. Store in your freezer until you need them. Notes — Keep in mind that when you thaw the rhubarb, it will lose some moisture. In the process of freezing, ice crystals are formed in whatever it is that you’re trying to preserve. These crystals rupture cell walls, which is how you get all that liquid. The cells can no longer hold everything together, so everything just kinda spills out. Now don’t discard any of that liquid. I say that you should save that liquid and just put it into whatever recipe on which you are working. Or you could use it to make syrup, or make a sauce, or something along those lines. One way that you can avoid all these hassles (but get a whole different set of hassles) is to use dry ice. Dry ice freezes everything so quickly that large ice crystals don’t have a chance to form. So in theory, once you thaw something that was frozen with dry ice, it should taste and feel the same as if it were fresh. I got this from Alton Brown on his show Good Eats. It was on one of his shows (Here’s part 1 and part 2 of “Strawberry Sky”. The bit about freezing is in part 2). It’s a shame that they won’t be making any more Good Eats shows. This entry was posted in Techniques and tagged Food, Techniques. i’ll probably be using those to make some rhubarb syrup and rhubarb rugelach over the winter. nothing like a nice taste of spring / summer when there’s 2 feet of snow on the ground!